This beautiful Contextual Image of the Dwarf Planet 1-Ceres, taken by the NASA - Dawn Spacecraft on October, 2, 2015, and centered at approx. 59� North Latitude and 258� East Longitude, demonstrates (if that was still necessary...) how the (approximate, of course) age of Impact Craters can be revealed by their relative positions (such as the positions that they have with respect to each other). In many cases, as it is with the Craters visible at the center of this view, the younger Impact Craters are "superposed" on (meaning that they are located "on top of") older Impact Craters which lay below. The largest Impact Feature in the scene, is the roughly the approxi. 48 miles (such as about 77,248 Km) wide, Geshtin Crater, which is superposed by the younger Datan Crater which, on the other hand, is about 37 miles (such as approx. 59,545 Km) in diameter. On its upper-left Rim, Datan Crater is, on its side, superposed by another, smaller, and even younger, Unnamed Impact Crater. Just out of curiosity, even in this picture, looking toward the center/right (Dx) of Geshtin Crater, at least three White Spots can easily be seen. 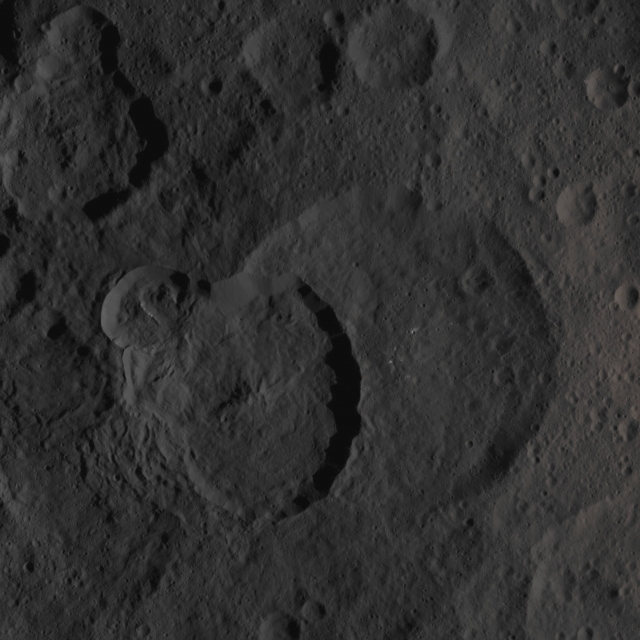 This image (which is an Original NASA - Dawn Spacecraft's b/w and NON Map-Projected frame published on the NASA - Planetary Photojournal with the ID n. PIA 20000 - Dawn HAMO Image 57) has been additionally processed, extra-magnified to aid the visibility of the details, contrast enhanced and sharpened, Gamma corrected and then colorized (according to an educated guess carried out by Dr Paolo C. Fienga-LXTT-IPF) in Absolute Natural Colors (such as the colors that a normal human eye would actually perceive if someone were onboard the NASA - Dawn Spacecraft and then looked ahead, towards the Surface of 1-Ceres), by using an original technique created - and, in time, dramatically improved - by the Lunar Explorer Italia Team.